The scientific and medical research communities have been looking to develop robots that measure in the nanometer range (that’s one-billionth of a meter) for quite some time. Being so small, they would be able to perform difficult tasks, such as targeted drug delivery to specific cells, or the elimination of harmful antigens, pathogens or viruses. However, the development of such machines raises numerous challenges. For one, making them small enough to fit between cells remains tricky, and these tiny bots would also need a propulsion system that will allow them to navigate their way through the human body. But now, in a paper published in the June 2014 issue of ACS Nano, an Israeli and German team announced the creation of the smallest nanobot yet, a magnet-guided corkscrew which is propelled by a tiny helical propeller. The team is comprised of researchers from the Technion-Israel Institute of Technology, the Max Planck Institute for Intelligent Systems, and the Institute for Physical Chemistry at the University of Stuttgart, Germany. Led by Dr. Peer Fischer at the Max Planck Institute, the research team created the tiny helical nanopropeller from a filament of silica and nickel that measures just 70 nanometers in diameter and 400 in length. That’s more than 1,000 times smaller than the width of a human hair, or 100 times smaller than a single red blood cell, making the wee machine the tiniest nanopropeller humanity has ever created. Instead of carrying its own motor, the propeller is powered by an externally-applied weak rotating magnetic field which causes the prop to spin, driving it and its attached payload forward. In order to test it, the scientist placed it in a hyaluronan gel, which is similar in consistency to bodily fluids. 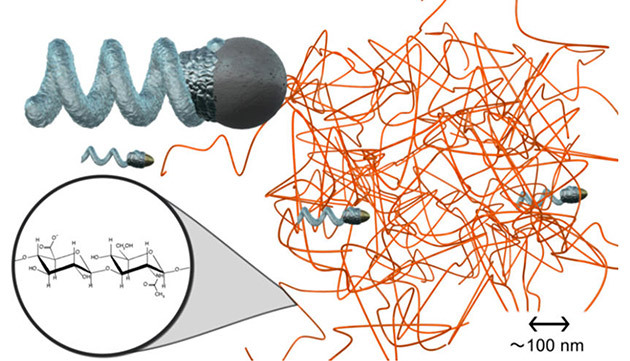 Like those fluids, the gel contains a mesh of entangled long polymer protein chains. In previous studies, larger micrometer-sized propellers got caught in these chains, slowing or completely halting their progress. The new nanoprop, however, was able to move relatively quickly by simply passing through the gaps in the mesh. actually display significantly enhanced propulsion velocities, exceeding the highest speeds measured in glycerin as compared with micro-propellers, which show very low or negligible propulsion. 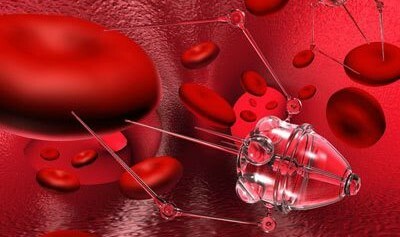 The applications for this device certainly include targeted drug delivery, where the nanobots would be equipped with insulin, antibiotics, or even chemotherapy drugs which they could then deliver to specific cells in the body to speed up the delivery process and reduce side-effects. Scientists could also attach “active molecules” to the tips of the propellers, or use the propellers to deliver tiny doses of radiation. The applications seem wide, varied, and exciting, from combating diabetes to fighting cancer and HIV with surgical precision. And developments like these, though they measure in the billionth of meters, they add up to a future where lives are healthier, longer and more prosperous.